A library is a huge storage of informational materials for students and staff members. These informational materials usually consist of books, journals, guides, practical manuals, magazines, CDs, etc. Classifying, organizing the books and managing them as per the author, subject, etc. is a very complex task and so the need of a library management software arises. Similarly, registration of books, cataloguing, books circulation, books purchase and keeping records of these books becomes difficult especially when all books are kept in a single storage space. 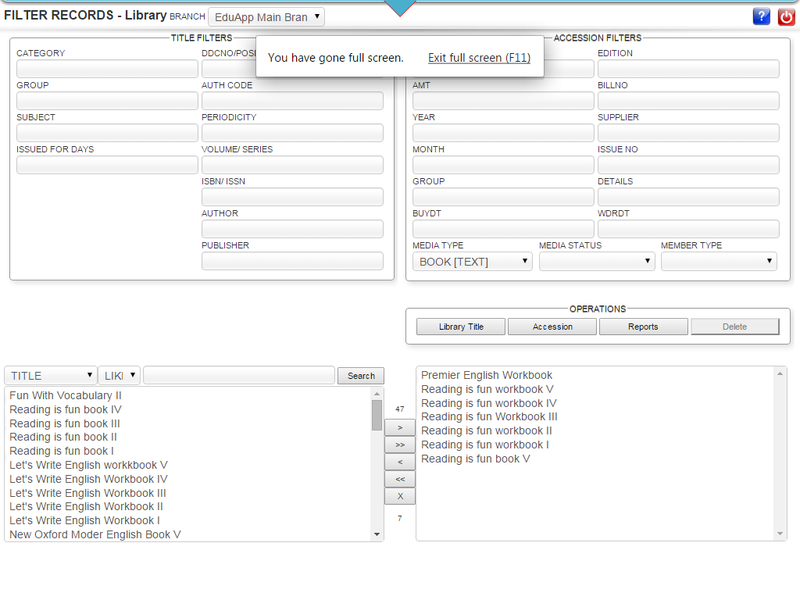 The library management module is very similar to the inventory management module in ECAS (Enhanced Campus Automation Software). The library registration panel in the software is where you register books by entering its title name & id, group, subject, author name & code, volume, etc. Once you click on update, the book is registered in the database. 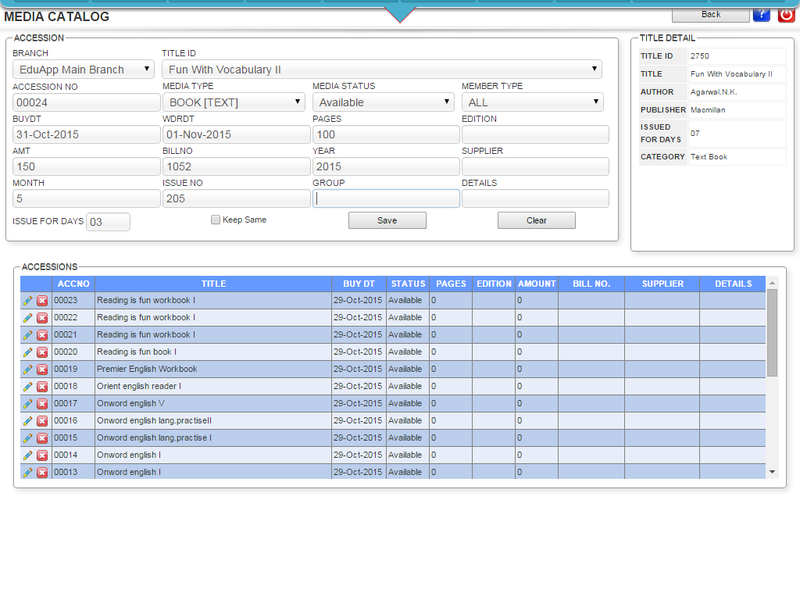 The search panel gives you multiple filter options for complex searching through the database of the software. Using title filters like group, subject, author name & code, periodicity, publisher, issue status, etc. provides you with an elaborate mechanism for searching the exact book that you are looking for in a library. When a book is issued by a student or staff members, along with the book details, issue date, issue for days, name of the person issued, fine amount for delay, return date, reissue, etc. can be updated in the same module. 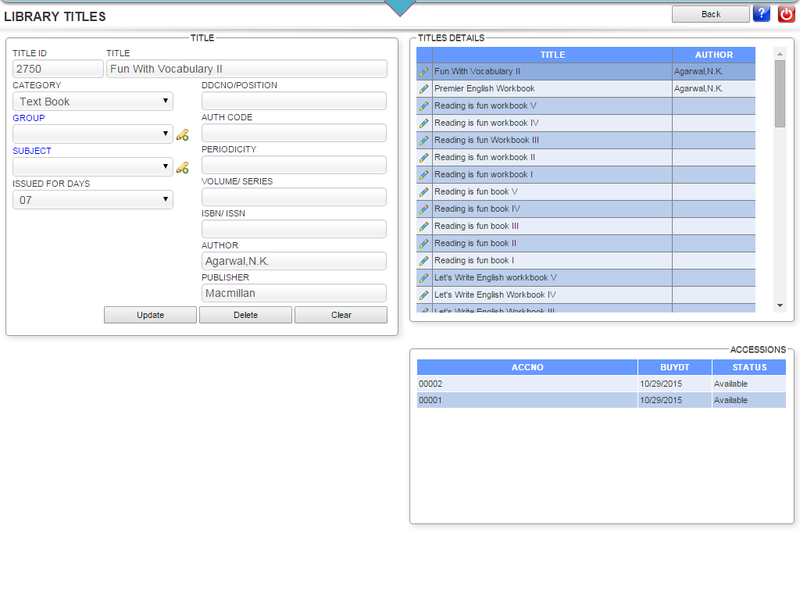 Through this module, you can search for a student and the detailed list of all issued items by the student are displayed. You can also check the past records of lost, damaged or returned books by a student from the same panel. If a book is unavailable and issued to other students, it can be reserved for students who have already booked it. ECAS is such a technologically advanced software that the librarian can scan the student details from the barcode of ID cards and the accession no. from the book. Once issued, an issue slip can be given to the student instantly and after submission, it can be updated as lost, damaged or simple return. You also have to maintain regular supply of books in the library so as to meet the staff and students requirements. Once you have selected a book, clicking on the accession operation gives you the accession panel where you get a summary list of media catalog with details like accession no, title, buy date, status, edition, amount, bill no., supplier details, etc. You can select the book from the lists, update bill details for its procurement. To track the reports of books, you can go to reports panel, enter appropriate details and the software searches through its database to output the result. These reports can be withdrawn with the combination of filters and is available for preview and printing in several formats. The detailed list of book reports can also be exported in Excel and PDF. Using ECAS software for library can help you track the availability of books subject-wise, author-wise, edition-wise, etc. Locating books manually is very time consuming. Using a software for library management system can save you lot of time and efforts and can reduce the workload of the library staff. Books can be categorized according to subjects, author, departments, branch like engineering, medicals, arts, commerce, literature, etc. Management of such catalogue of books is very hugely beneficial in schools, colleges and big universities. ECAS helps in tracking books especially when they are issued by students to avoid misplacement or theft. Such simplified solution of complex tasks of a university management system has been incorporated into a single and dynamic software, that is, ECAS.